A couple reasons to choose us! 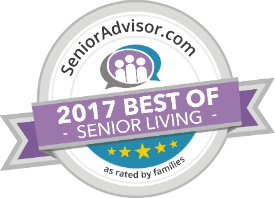 Rated the 2016 Best of Senior Living community and awarded the SeniorAdvisor.com Best of 2017 Award, we are proud of the continued recognition that we receive from families and current residents. If you would like to read more about Princess Martha or check out some recent reviews, please click the link below to visit SeniorAdvisor.com. Plus, The Princess Martha was a 2014 Good ‘Burger Award nominee!